Effortless and Effective Foot Care- No skill required. 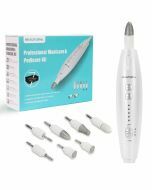 Simply move Beautural Electronic Foot File gently over callused, rough skin for beautiful, smooth skin within minutes! Waterproof IPX4 - Enjoy a personal pedicure anywhere! Foot File is suitable for both wet & dry feet. Rechargeable & Long-lasting - Cordless with internal integrated battery. Runs continuously for 45 minutes. Two Filing Speeds & 3 Roller Heads - Personalize your foot care by choosing the speed and the roller head most comfortable for you. Ergonomic Shape - Anti-slip, shaped handle provides a comfortable, secure grip for the perfect pedicure. Have foot calluses, rough cracked skin, or hyperplasia but don’t have the time or money for expensive pedicures? Beautural Electronic Foot File is here! Get smooth, clean, healthy, attractive feet within minutes from the comfort of your own home. 1. Much faster than traditional pedicures. Get smoother, healthier feet while watching TV, between chores, or before going out. 2. Carefully controlled, constant rotation speed ensures Electronic Foot File won’t damage healthy skin. 3.Waterproof so it’s perfect for daily use at home or during travel no matter dry or wet feet. 4.Integrated internal battery to run continuously for 45 minutes (a single deep pedicure treatment or 2-3 routine maintenances). Save money vs replaceable batteries. 5. Receive the most comfortable pedicure by choosing your most preferred of 2 filing speeds. 6. Comes with 3 different roller heads that can be easily switched in and out depending on the amount of filing needed. The bottom of Electronic Foot File should not be immersed in water. Does this come with the lithium-ion rechargeable battery. I do not see it mentioned herein? Thank you! Yes, it comes with a built-in rechargeable Li-ion battery.